We step back from the "one blockbuster per week" release strategy for a brief period as three middle tier summer films make their way to theaters. It's one of the few weekends of summer without a true "must-see" film, but one of the few with choices. Guillermo del Toro is back with his twisted visual sensibility for Hellboy II: The Golden Army, the sequel to the 2004 Hellboy film. Picking up where he left off with the captured and reformed demon that fights otherworldly bad guys for a secret American government agency, he pits Hellboy against the mythical world, which is aiming for a take-over of this one. A huge part of the appeal of Hellboy is the lovable-ness of the character, a gruff, blue-collar super-hero who just happens to be giant and red. 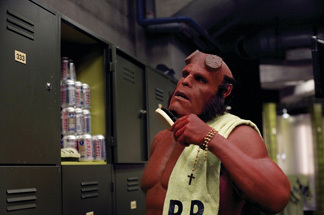 As played by Ron Perlman, he's one of the more lighthearted and enjoyable comic characters to watch on screen, in contrast to the enemies he fights, which tend towards the "unspeakable horror" type. Visually, del Toro seems to have upped his game as well, learning from and expanding on his ideas from Pan's Labyrinth. It's a much more interesting looking picture this time around, even if he does tend towards the grotesque. Curiously, the film's advertising is treating this almost as a reboot, hoping to reach a group of viewers who haven't heard of the character through the comics or his previous movie.